Peace Corps Online: July 1, 2000: Headlines: COS - Belize: NGO's: Environment: Reefs: Green Reef: Green Reef has had two full time Peace Corps volunteers as part of its staff. Ann Hayden and Jill Hepp worked with Green Reef from August 1999 to July 2000. July 1, 2000: Headlines: COS - Belize: NGO's: Environment: Reefs: Green Reef: Green Reef has had two full time Peace Corps volunteers as part of its staff. Ann Hayden and Jill Hepp worked with Green Reef from August 1999 to July 2000. Peace Corps Online: Directory: Belize: Peace Corps Belize : The Peace Corps in Belize: July 1, 2000: Headlines: COS - Belize: NGO's: Environment: Reefs: Green Reef: Green Reef has had two full time Peace Corps volunteers as part of its staff. Ann Hayden and Jill Hepp worked with Green Reef from August 1999 to July 2000. Green Reef has had two full time Peace Corps volunteers as part of its staff. Ann Hayden and Jill Hepp worked with Green Reef from August 1999 to July 2000. Green Reef Environmental Institute Ltd. is a non-governmental organization, registered under the Company's Act, Chapter 206 in Belize. The organization was founded in 1997, as Belize's first, non-profit conservation & education organization exclusively dedicated to the protection of its Barrier Reef and surrounding marine environment. Green Reef is largely a community-based NGO with interests in training, management & research. Its board of directors, which are comprised of San Pedro Island residents, governs the organization. Green Reef has had two full time Peace Corps volunteers as part of its staff. Ann Hayden worked with Green Reef from August 1999 to July 2000. 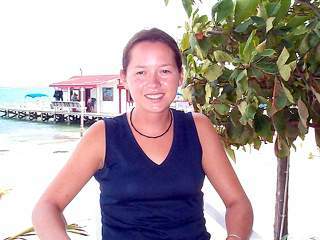 Ann worked primarily on developing the management plan for the Los Salones Caye and Little Guana Caye Bird Sanctuary and was instrumental in carrying out environmental education and advocacy work with Green Reef. Ann started the weekly Reef Brief column that is featured in the San Pedro Sun. Jill Hepp who started with Green Reef in August of 2000 will continue until August 2002. Jill is responsible for helping manage the Nassau Grouper Reseach and Advocacy Project that has been a focal point of Green Reef's work over the past year. Jill has also participated in the Shallow Water Coral Reef Monitoring Project.